John McDonnell says “I’ll stand for Labour leader when Brown goes"
How can the Climate Camp progress? Postal Workers - Don't Turn This Truce Into Surrender! Friends, sympathisers, members of the Alliance for Workers’ Liberty, and many other leftists interested in exploring ways to rearm the labour movement, will be meeting in London on 28-29 November for the AWL’s winter school. Unlike many other weekend gatherings of the left this month and next, this event will be about serious debate and study. It aims to be a focal point from which thought-through, collectively-understood ideas and strategies — and people inspired by those ideas and strategies — can radiate out into the labour movement. Martin's Smith article on "How do we stop the BNP?" 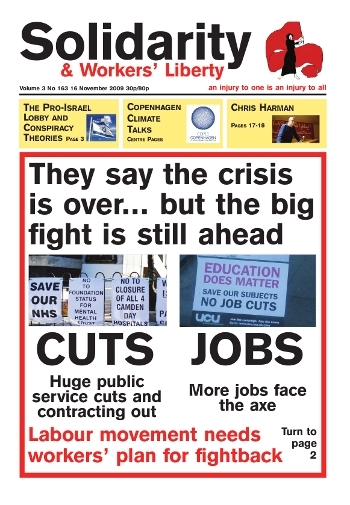 in the last issue of the SWP's International Socialism journal is worth a read - for good and bad reasons. Good reasons? Facts. Bad reasons? Politics. While Cath Fletcher (Solidarity 3/162) is absolutely correct to point out how any evaluation of an individual or a political situation requires rounded, balanced assessment in order to form as concrete a picture as possible, the evidence she offers in her article “Berlusconi: some further questions” do little to convince me that her image of Berlusconi and of contemporary Italy come anywhere near the reality I sought to convey (in Solidarity 3/161). The British anti-fascist movement is at a crossroads. Holding the growth of the BNP is getting harder every year and the post-war strategy of “No Platform” plus “Exposure” is being by-passed by significant changes taking place. In his keynote speech to the Labour Representation Committee conference on 14 November, John McDonnell’s general assessment was that we are in a “difficult period”. We have “got to keep the Tories out”, but we know how bad New Labour is. “Our job is to act as beacons in the darkness”. John McDonnell MP spoke to Solidarity at the Labour Representation Committee conference on 14 November after he had announced that he will contest the Labour Party leadership again when Gordon Brown goes. The Labour Party conference this year was the smallest Labour conference since the Second World War. The number of constituency delegates was significantly down, and even trade union delegations were smaller this year. That’s the sad reality. An activist with the Camp for Climate Action (Climate Camp) spoke to Solidarity about some shortcomings in its current politics. For me I would note two weaknesses of the Camp’s ability to be successful, i.e., to challenge the power structures and fantastical economics that have lead the world towards ecological collapse. The Stop Climate Chaos (SCC) coalition aims to mobilise 40,000 people for the largest ever climate demos in the UK on 5 December. In London, the demo is assembling at 12 noon in Grosvenor Square. It plans to climax at 3pm by encircling Parliament with a sea of people wearing blue. The details for Glasgow are not yet finalised. •	Act Fair & Fast. The climate talks in Copenhagen in December had been billed as the most important international meeting since the Second World War. Instead, they are likely to be the greatest let-down since global warming was first debated internationally two decades ago.